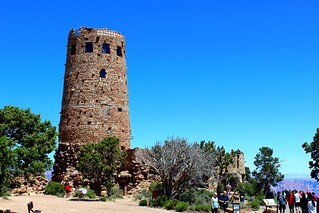 We managed to get on the road earlier on Day 5, heading out at 8:30 a.m. to re-enter the park and head east on Desert View Drive for a series of viewpoints strung along the 20 miles between the visitor center and the Desert View Watchtower at the southeastern edge of the Grand Canyon. 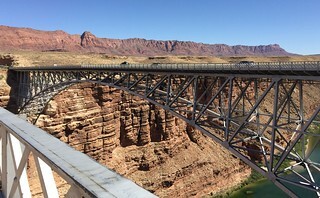 After that we drove 100 miles to Navajo Bridge across Marble Canyon. There were relatively few tourists at the first four viewpoints, although we had crowds when we arrived at Desert View around lunchtime. 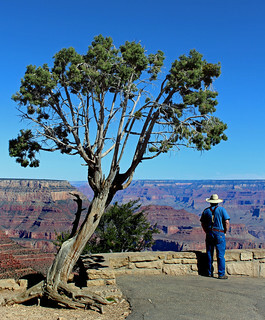 Two short video clips Wendy shot at Mather Point on Monday afternoon and at Lipan Point on Tuesday morning show the difference. I slowed the clips down, so if you turn up the volume, you’ll hear what sounds like a wailing man, but it was actually just a crying baby! 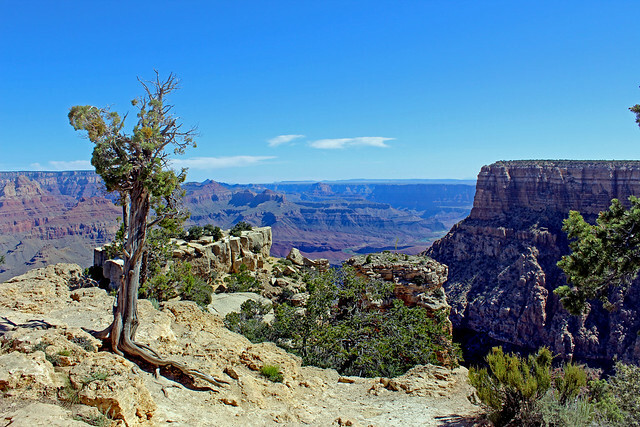 Grandview Point, the southernmost view on the South Rim, offered a tremendous view of Horseshoe Mesa below us. That is where Pete Berry operated the Last Chance Mine from 1893-1907, extracting copper ore which was hauled by teams of mules up to the Grandview Point. It was one of the few profitable mines in the area. There is still a trail leading down to the mine, which relies upon log cribbing and other tricks to shorten the trek. The view to the west was also tremendous, and I took snapshots of John and Betty with that background. Grandview gets more rainfall than the other viewpoints, so there were actually some flowers here, which Wendy captured with her lens. Moran Point was next. I presumed it was named after Thomas Moran, whose spectacular landscapes are among my favorite paintings. 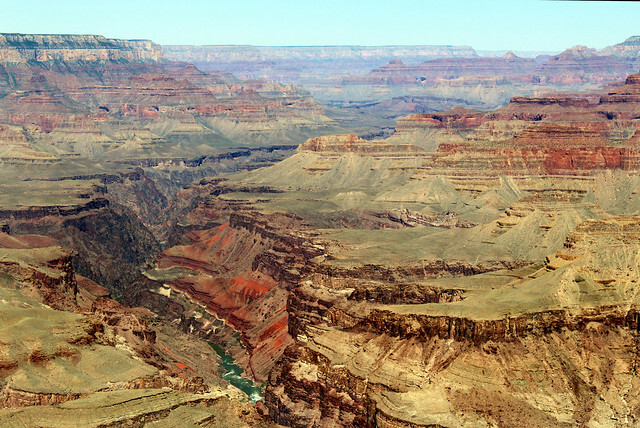 But it is probably named for his brother, Peter, who traveled to the South Rim in 1881. There were quite different views to the east and west from this viewpoint. Since I am pulling together photos from four different cameras for this post (my Canon EOS Rebel T6, Canon PowerShot SX700 HS, and both Wendy’s and my iPhone 6 cameras), which were not time-synchronized, I sometimes have to look up a location online for verification. That led me to a beautiful daybreak photo Adam Schaullau captured at Moran Point. I don’t pretend to have the patience or skill for such a shot, but I certainly can admire it. The Tusayan Pueblo Ruins were next, on the opposite side of Desert View drive from the viewpoints. These were used for about 20 years, starting around 1185, and are one of the 4,300 archeological sites in the park. The bases of the walls are stabilized in place, and there are traces of a large kiva at the site. 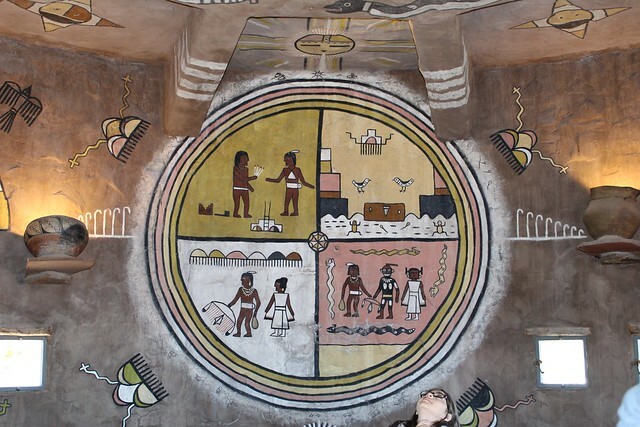 The little museum dates back to 1928 and is an interpretation of a Hopi structure. 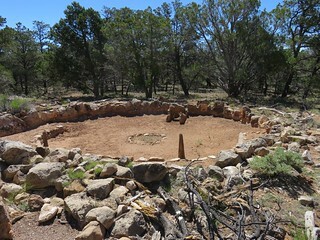 The ancestors of the Hopis who occupied this and similar sites were once referred to as Anasazi, a Navajo term for “ancient enemies”, which offends contemporary pueblo dwellers. So the term “ancestral puebloans” is now used. Lipan Point was our next stop for viewing, which had a good view of the Colorado River to the west, including Hance Rapid, where the river falls three stories and side stream boulders make it a challenge for those running the river. There were also good views to the east of the Colorado, and sharp-eyed John spotted a boat going down the Colorado far below. The crowds were back with us, with so many people in the tower that I only made it to the second level to view some of the paintings on the walls by Fred Kabotie. There were so many people on the narrow stairs that I did not care to climb higher. Wendy pointed out the Reflectoscopes, black mirrors mounted beside some of the windows. Back around the start of the 19th century, landscape painters would use similar devices of black onyx to condense and simplify the views they were sketching. Much like the filters used in Photoshop, the devices could emphasize the colors and lines in a view. Back outside, Wendy spotted a lizard as we made our way over to the Desert View General Store for a lunch of Indian tacos. 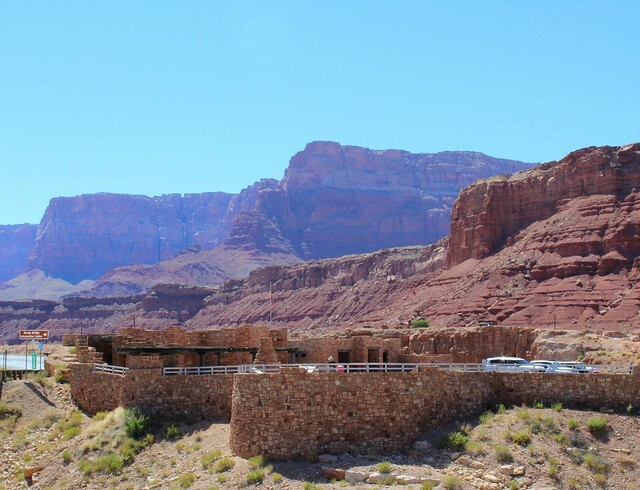 Ready to leave the crowds behind, we set out on a 100-minute drive to Navajo Bridge across Marble Canyon. 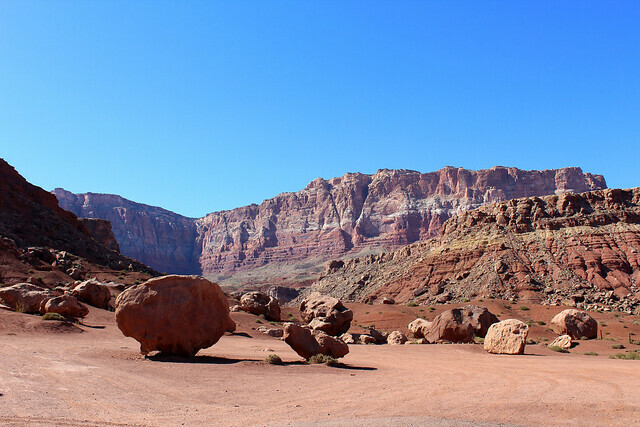 We exited the park on Highway 64 and soon reached the Gorge of the Little Colorado River. It drains the Painted Desert and most of it is a dry braided wash which only has water after heavy snowmelt or a flash flood. 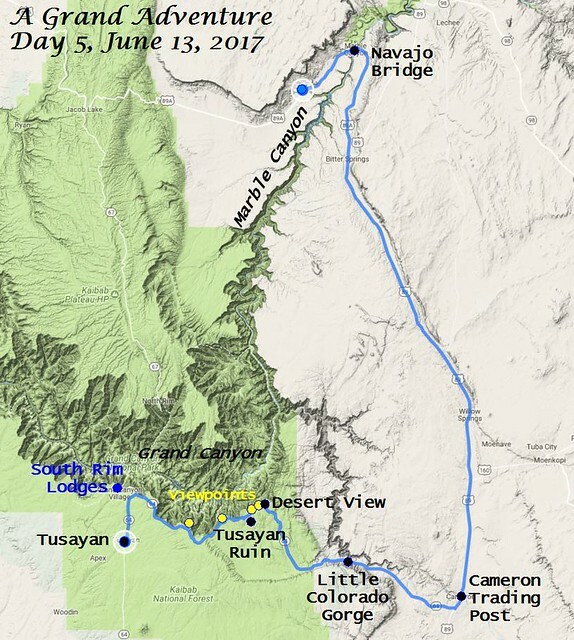 The lower 57 miles are the Little Colorado River Gorge, which reaches a depth of 3,000 feet by the time it joins the Colorado River near Desert View. 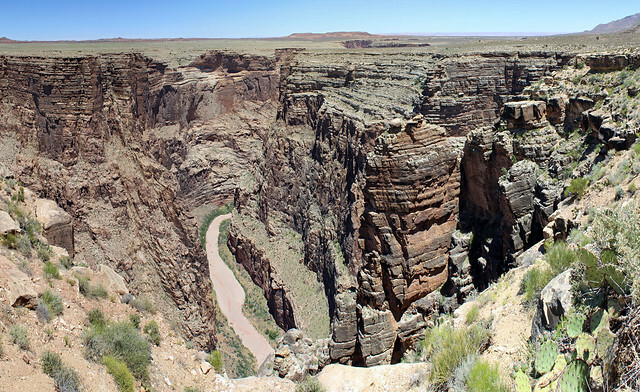 The Navajo Nation had a scenic pull-out for the gorge, and we discovered it was a short hike to get a good view of it. While Wendy and Betty examined trailside rocks, John and I forged ahead for the view. We saw a dry wash at the bottom of the steep walls of the gorge. It is a lo[a]thesome little stream, so filthy and muddy that it fairly stinks. It is only 30 to 50 [yards] wide now and in many places a man can cross it on the rocks without going on to his knees … [The Little Colorado was] as disgusting a stream as there is on the continent … half of its volume and 2/3 of its weight is mud and silt. [It was little but] slime and salt … a miserably lonely place indeed, with no signs of life but lizards, bats and scorpions. It seemed like the first gates of hell. One almost expected to see Cerberus poke his ugly head out of some dismal hole and growl his disapproval of all who had not Charon’s pass. It turned out they were seeing the effects of a rare flash flood. When and where it flows, the river is normally a bright blue color caused by dissolved travertine and limestone in the water. The main Colorado River is green these days instead of reddish-brown, something we’d noticed from the various overlooks. 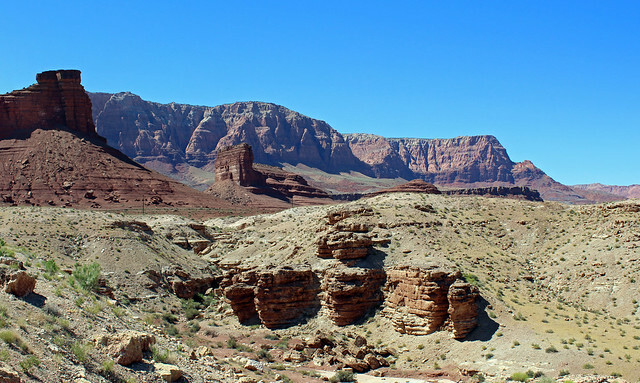 This is because the Glen Canyon Dam above Marble Canyon traps sediment. Marble Canyon is north of the Grand Canyon, being the segment of the Colorado River that lies between Lee’s Ferry and where the Colorado joins the Little Colorado. We were headed to the Navajo Bridge over the canyon. 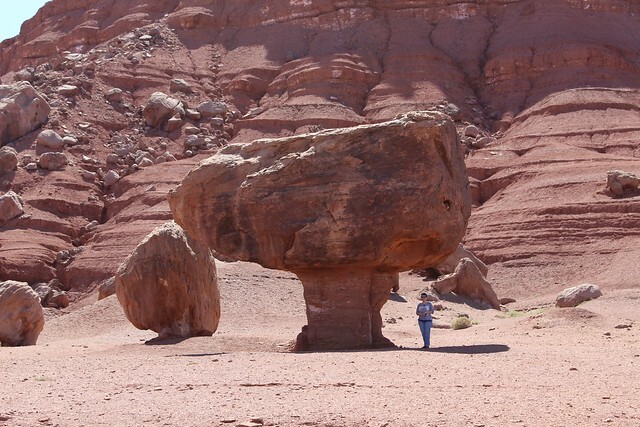 Wendy was fascinated by the varied landscape as we traveled north on Highway 89. Contrasting gray layers of ash told of a volcanic past that varied over time. Higher up were brown and red layers of more recent times, giving way to still lighter tones. Small settlements were dwarfed by the background rocks. We finally reached the dual Navajo Bridge. 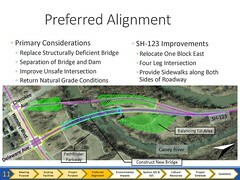 The older of the two steel spandrel spans is to the left in the photo and north of the later span. 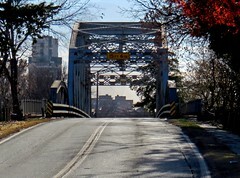 The old bridge was built from 1927-1929, is a 834 feet long, but only 18 feet wide. 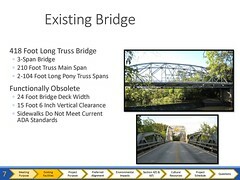 It was finally replaced by a new span built from 1993-1995, which is 44 feet wide. 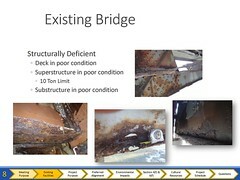 The old span is still open for pedestrian use. Both spans are about 470 feet above the Colorado River. I was fascinated by the visitor center, which beautifully integrates with the landscape. It is an extension of the 1930s Wayside Observation Shelter which was built in the rustic southwestern style by the Civilian Conservation Corps. We walked out on the old bridge to look down at the Colorado. I was struck by how narrow the bridge was, and glad we had crossed on the much wider span to the south. The cliffs west of the bridge were quite beautiful in a formidable way. Just four miles north of the bridge was Lee’s Ferry. We turned off the highway and ventured up to the crossing. 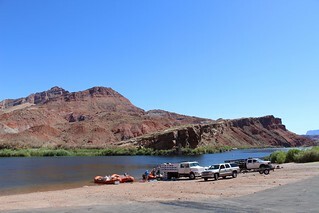 Lee’s Ferry provided boat service across the Colorado for sixty years. John Lee, a Mormon who had participated in the Mountain Meadows massacre, established the service in 1873 to serve Morman settlers traveling from Utah to Arizona. He only ran it for four years before he was executed for his role in the massacre 20 years earlier. The Morman church bought the ferry in 1879, and it continued to operate under different polygamist managers until the Navajo Bridge was completed in 1929. We did not find any historic signage or buildings at the ferry crossing, just the spot where some rafts are put into the river. The slope across the river was Lee’s Backbone, a dangerous incline wagons once traveled to climb up the south side of the valley. We missed the turn leading to the Lonely Dell Ranch where Lee lived, which does have structures from the time he and others ran the operation. 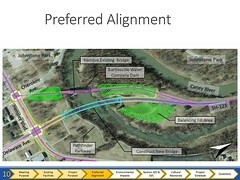 The area could certainly use some more prominent signage and should offer maps and brochures at the pay station. There were large roadside hoodoos in the park and vicinity. Wendy scrambled out to pose beneath one to provide scale. We drove a bit west on highway 89A past Navajo Bridge, the route to the Grand Canyon’s less visited North Rim, to see the Vermilion Cliffs. But it was growing late, so after a quick look at one stretch of the cliffs we turned back to return to the Grand Canyon’s South Rim. 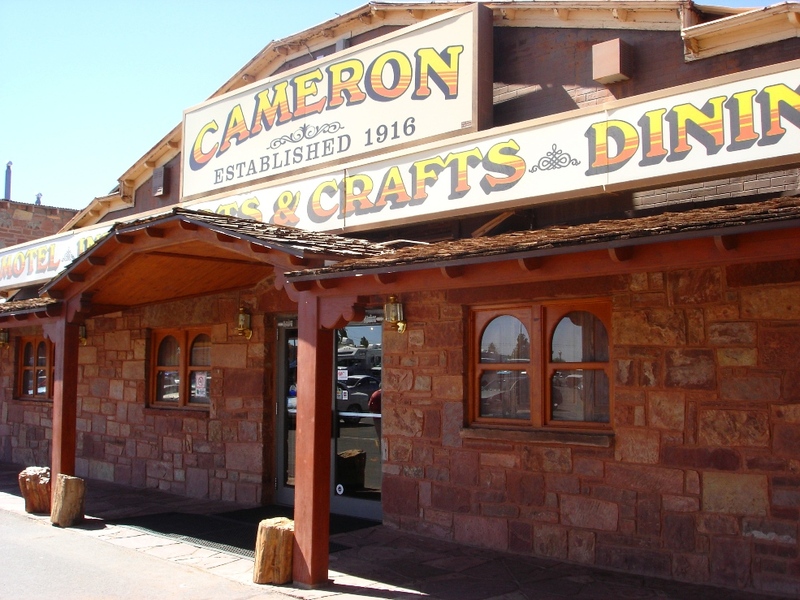 On the return trip we stopped at the Cameron Trading Post where highway 89 crosses the Little Colorado. This large facility was busting with tourist trinkets and had a large dining room and hotel area. There really isn’t much else for tourists along the route, so the trading post was busy. Traders Hubert and C.D. Richardson opened the post in 1916 after a suspension bridge was built nearby. Early visitors were mainly Navajo and Hopi Indians who bartered hand-made goods for food staples. We weren’t ready to eat, so we returned to Tusayan and ate at We Cook Pizza & Pasta. We turned in, knowing that the next day would begin our return eastward, including a stop in Holbrook, Arizona for the ladies to purchase petrified rocks before we headed north through the Petrified Forest.